Isn’t shopping around for an insurance coverage exhausting to start with? Unlike other shopping experiences, buying insurance coverage requires thorough research of various facets that impact your premium rates in the long run. It’s easy to get a cheap quote these days, however buying from the right insurance carrier involves a detailed analysis. Before buying, you must be able to answer some basic questions such as – what’s the minimum liability coverage required for your state, what happens if the at-fault party in an accident is uninsured, how much coverage is sufficient for your car or will your insurer pay if your car gets damaged in a storm? To make the process less daunting for you, we have created this thorough guide that would help you to buy car insurance in Arkansas. Fun Fact: There’s a legal code that discourages people from pronouncing Arkansas incorrectly (by the way, the correct pronunciation is “Ar-Kan-Saw”)! Now that we have got that right, let’s dive into the guide for car insurance in Arkansas. If you wish to compare rates in your state, you can use our FREE online tool. Enter your zip code now to get started! Car insurance coverage requirements vary from state to state, and that’s why it’s important to know the specific coverage that you must buy to drive a car in your state. In Arkansas, it’s illegal to drive without the minimum coverage or proof of financial responsibility. Also, you must maintain coverage throughout the period you own a motor vehicle. Now that we have established that you need to buy car insurance if you wish to drive in Arkansas, let’s help you understand the basics of car insurance. In this guide, we would touch on each and every point that would ease the process of buying car insurance for you. In case you want to compare average premium rates in your state, you can use our FREE comparison tool. To drive a motor vehicle in Arkansas, your car insurance must include bodily injury and property damage coverage. Bodily Injury: If you’re involved in an accident, the bodily injury coverage would cover the cost of medical expenses to the third-party who was injured in the accident. The minimum coverage law in Arkansas requires you to buy insurance that would pay medical expenses up to $25,000 for each injured person with a maximum limit of $50,000 per accident. Property Damage: When you’re involved in an accident, you also end up damaging the third-party’s car for which Arkansas’ minimum coverage law requires you to buy insurance that can pay $25,000 to cover the loss. Liability coverage also pays for the legal defense cost if the third-party decides to file a lawsuit against you. Though there are minimum coverage laws in your state, it’s recommended that you buy additional coverage to pay-off the damages in case you’re involved in a major accident. The laws of every state require a motorist to carry proof of financial responsibility which shall be presented as per need. What does Financial Responsibility mean? In the auto insurance industry, the financial cost a motorist is liable to pay when he/she causes an accident that leads to injury or damage is known as financial responsibility. In 2014, the annual per capita disposable income for households in Arkansas was $33,929. And, the average annual premiums for full coverage was around $900 which means the cost of premiums is approximately 2.65 percent of the income. Though you’re required to pay only $75 per month for full coverage, the ratio of premium cost to income is a bit on the higher side as the national average is around 2.37 percent. The table shows the average premiums paid by residents of Arkansas in the year 2015, that includes liability, collision and comprehensive coverage. The amount of premium varies from person to person depending on what kind of coverage one chooses. Note that the state requires you to buy a minimum liability coverage of 25/50/25 which might cost much lower than the average premiums. However, it’s recommended to buy additional coverage to pay-off damages in case you’re involved in a severe accident. In the Auto Insurance Database Report 2016, published by NAIC, the combined annual auto insurance premium in Arkansas was $950 making it the 24th cheapest state in combined auto premiums. The national average for combined auto premiums was $1,062 in that year. In its border states, Arkansas ranks third in combined auto premium quotes with better rates than Mississippi, Oklahoma, Texas, and Louisiana. Till now, we have looked mainly at three types of auto coverage – liability, collision, and comprehensive. But, there are other coverage options recommended to cover a few unforeseen circumstances. When buying coverage, you should know whether your state is – an at-fault state or no-fault state? Arkansas is an at-fault state which means that the person responsible for causing the accident would have to pay the cost of personal injury and property damage. In no-fault states, motorists can only turn to their own insurer to pay-off damages irrespective of who was at fault. The personal injury protection coverage is required in these states to cover for any injury or damages arising from accidents. Drivers in Arkansas needn’t worry about reaching out to their own insurer, because the at-fault party is liable to pay damages. Arkansas is considered an add-on state when it comes to no-fault laws. This means that drivers in Arkansas have a choice in buying the personal injury protection coverage – they can either refuse it or add it. Optional coverage, such as Medical Payment, Personal Injury Protection, Uninsured/Underinsured Motorist Insurance, aren’t mandatory in Arkansas. These options, however, help you in circumstances that are completely unpredictable. For instance, how would you feel if you get hit by a motorist who’s uninsured and your policy doesn’t have coverage to pay for your loss? These additional coverage options help you when the at-fault party is unable to claim third-party damages. As per estimates, Arkansas ranked ninth among states with the highest percentage of uninsured motorists in 2015. Around 16.6 percent of the motorists are uninsured on the roads you’re driving on! That’s not a small percentage of people driving without an auto insurance policy and that should be a cause of worry to you. You can also watch this interesting video on why additional coverage matters for drivers in Arkansas. Getting the right coverage at the cheapest rate is something that everyone aims for. While that approach makes us happy, you should also know about the add-ons and riders that you can add to your policy. It’s always wise to be aware of what is available in the market. Do browse through the following coverage options that might save you from an unexpected cost in the future. Across the country, its widely believed that men and women are charged different rates even if they have the same profile and driving history. As per the table above, the rates for males and females are almost similar in the 35-60-year-old age group. However, auto premiums are significantly higher for males in the 17-25-year-old categories. There are many factors involved in calculating rates which take into account the demographics. However, almost 48 percent of people in America think that insurers charge higher premiums from men than women. Usually, we choose a car insurance carrier on the basis of auto premium quotes, without much thought to the insurers’ reputation in the market. Factors, such as financial ratings, consumer complaints, claims satisfaction history, are rarely considered by consumers before buying insurance. Do remember that in the event of an unfortunate accident, how well your insurer handles the claims settlement process from the first notice of loss (FNOL) to the final settlement depends on these above-mentioned factors. Don’t worry, we have done the necessary research for you! In the next few sections, we would talk about these factors and provide facts about each insurance carrier in your state to help you make an informed decision. The financial strength of your insurance provider determines whether they would be able to settle a claim in case you’re involved in an accident. On the macro level, rating organizations assess the balance sheet of insurers to ensure the long-term financial viability of their operations. Before buying an insurance policy, checking the A.M. Best Rating would give you some peace of mind for later. A.M. ratings of A+ to B mean superior to fair financial strength and anything below B isn’t financially viable, ranging from marginal to poor. Customer satisfaction surveys are the true indicator of a company’s services. Financial ratings might not always be accurate, but customer ratings would tell you if an insurer acknowledges its obligations when a claim is filed. J.D. Power recently conducted a customer satisfaction survey to assess the overall perception of car insurance customers about insurance companies. In their 2018 survey, they found that consumer satisfaction has improved considerably in the US. In the image, you can see the satisfaction level of customers for the auto insurers in the Southeast region. Among these, Farm Bureau Insurance – Tennessee received the best satisfaction rating. Insurance in the digital era – Customers these days rate insurers on the basis of their digital interaction, omnichannel presence, transparency in premium hikes, usage-based insurance adoption etc. It’s not about just cost anymore. Now that you’re aware of the leading insurance providers in Arkansas, you must be curious about the average premiums charged by providers in the state. Do you know why your insurance company always asks – how many miles do you drive on an average? Since you get a slew of questions from your insurance agent, you might not know the relevance of each one. In usage-based insurance, the miles driven by you is taken into consideration to offer better rates. As you drive more every day, you’re exposed to more dangerous drivers and accidents, hence the higher quote. Apart from GEICO, State Farm, and USAA, insurance providers are charging the same rate for different mileages in Arkansas. Nevertheless, you can always ask your provider to offer you discounts based on your usage. As you can see in the table, car insurance rates vary significantly when your credit history changes from good to poor. Improving your credit score can be one of the ways to reduce your auto premiums. As per Experian’s State of Credit survey in 2017, Arkansas was among the ten states with the lowest credit ratings at a vantage score of 657. Vantage score is calculated based on your credit payment history to determine the ability to pay-off debts on time. 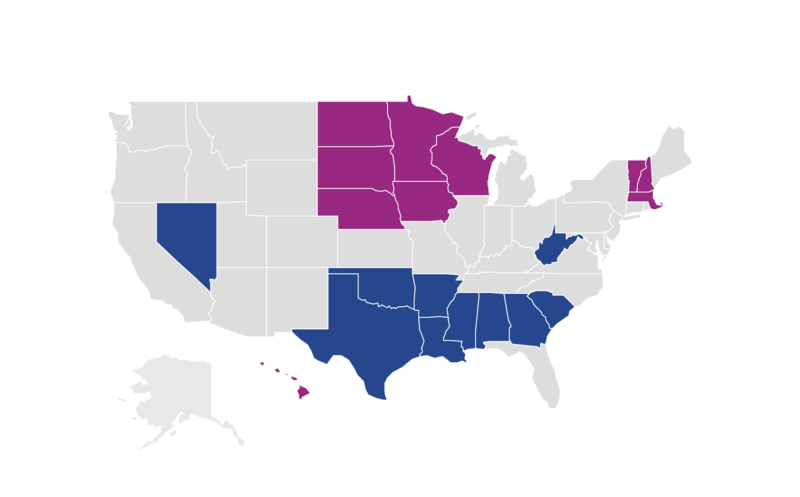 In the image below, you can see the states with the lowest vantage scores in blue color and the states with the highest vantage scores in purple color. A clean record can definitely get you the cheapest rate from all insurance providers, what’s worth noting from the table is the impact of driving under the influence (of alcohol/other drugs) on premiums. One incidence of DUI can raise your rates significantly and is considered more severe than speeding violations and accidents. Now that you have come this far in the article, you should read a bit about the state laws that aid people in driving safely. We want to specifically focus on state laws because law-abiding citizens get into fewer accidents, and that can really save you a lot in insurance rates as well as unnecessary headaches. Wherever you drive in Arkansas, just make sure that you follow the posted speed limits, licensing procedures, safety belt usage, mobile phone usage laws etc. If you feel that’s a lot to grasp, we have collated everything succinctly for you. In Arkansas, the Office of Motor Vehicle (OMV) and the Driver Services (ODS) are the departments responsible for all your vehicle and driver-related requirements. Road tests are administered by the state police of Arkansas. OMV and ODS are under the Arkansas Department of Finance and Administration (DFA), so you need to find offices of DFA for all your licensing and auto registration needs. The state law in Arkansas requires motorists to provide a proof of insurance when stopped by traffic police or requested by the DFA. The most common proof is the ID card issued by your insurance company. Do remember: The DFA maintains an electronic database to verify the car insurance status of vehicles. Apart from running a monthly check for registered vehicles, they also check for coverage status when you try to register a vehicle. Speeding violations, DUI and multiple accidents can prompt insurance companies to consider you a high-risk driver. And, by law, they have the right to refuse you insurance coverage. If you have been refused coverage by every other insurer, you can turn to the Arkansas Automobile Insurance Plan. The state allows you to apply to the plan through any car insurance agent and all insurers are required to participate in this plan. How does the Arkansas Automobile Insurance Plan work? Since all insurers must participate in this program, the plan fairly distributes the losses amongst the car insurers (who are licensed to operate in the state) that arises from insuring high-risk drivers. Once you apply to the plan, you will be assigned an insurer to whom you would have to pay the premiums. Here’s a short video with advice on how to get cheap insurance for high-risk drivers. There is no special mention of glass or windshield in the laws of Arkansas related to chips or cracks. As per the 2010 Arkansas code (§ 27-37-302) – “No person shall drive any motor vehicle with any sign, poster, or other nontransparent material upon the front windshield, side wings, side, or rear windows of the vehicle other than a certificate or other paper required to be so displayed by law if it obstructs the operator’s view or the safe operation of the vehicle”. A loss claim is considered an insurance fraud under two circumstances – when the accident for which a loss is being claimed didn’t occur and when the amount of loss is much lower than actually claimed. Selling bogus insurance policies are also considered insurance fraud. Penalties: As per Arkansas’s insurance fraud laws, insurance fraud is considered a Class D felony with jail time of up to six years, and/or fines to the extent of $10,000. Mandatory Reporting: An insurance company is bound by law to report any fraudulent activity that they come to know of to the insurance commissioner, and the failure to do so would be considered a Class A misdemeanor. If you’re injured in an accident or your property was damaged, there’s a deadline by which you can file a lawsuit or file a claim. For those who miss renewing their insurance policy, there’s a high probability that the state would send a notice about your coverage status even if you’re not stopped by the traffic police. The DFA runs regular checks on all registered vehicles. If you don’t comply with Arkansas’s laws for insurance coverage, you would have to face penalties and jail time. First Offense: If caught driving without coverage for the first time, the penalty ranges from $50 to $250. In addition, the traffic policy might handover a temporary sticker in place of the number plates and ask the motorist to show proof of insurance within 10 days. Second Offense: Driving without insurance for the second time leads to a more severe financial penalty, ranging from $250 to $500. Similar to the first offense, the traffic enforcer might take your number plates and ask for proof of insurance within 10 days. Third and Any Subsequent Offenses: A third offense leads to fines in the range of $500 to $1,000, along with imprisonment of one year. The state also suspends the vehicle registration if a motorist is unable to show proof of insurance within the stipulated time. Keeping an eye on the teen driving laws of your state is important for the safety of your kids and others on the road. Apart from the above restrictions, young drivers aren’t allowed to drive between 11 PM to 4 AM until they turn 18 because of the obvious risks involved with nighttime driving. If you want to know which cars are the safest for your kids, do watch this quick video. The license renewal procedures are pretty simple in Arkansas. Proof of adequate vision is required at each renewal for everyone. However, renewals by mail or online renewals are not allowed in Arkansas. If you want to drive without accumulating any points on your license, you should be aware of the rules in your state. Arkansas is an add-on state when it comes to no-fault car insurance laws. Motorists in Arkansas are required to buy minimum liability coverage, but also have the choice to buy first-party, no-fault insurance coverage. In the event of an accident, if you buy a no-fault coverage, your insuer would cover your damages, irrespective of who was at fault. The benefits also cover your damages if you were driving/riding in someone else’s car. Arkansas Code 27-51-301 – The law in Arkansas states that vehicles can’t be driven on the left lane except when they have to pass others (unless the right lane is undergoing repair work or is closed or if there’s an exit from the left lane). Quite recently, the state invested on new signs to be placed on roads asking slower traffic to keep right. Move Over Laws – In 2013, a new law was passed in Arkansas requiring motorists to move over to the furthest lane for vehicles of the Arkansas State Highway and Transportation Department and their contractors as well apart from the emergency vehicles. The speed limits across rural interstates, urban interstates, and other limited access roads in Arkansas is 75 mph. The speed can be raised to 75 mph on controlled-access highways if it’s based on engineering and traffic studies. The laws in Arkansas require drivers and front-seat passengers to wear safety belts. Though all front-seat occupants should wear seat belts, traffic police can’t stop a vehicle merely on the basis of a seat belt violation. Car Seat Laws – All children below the age of six or 60 lbs should be put inside a child-restraint system, while anyone below 15 should be buckled up irrespective of where they are sitting in the car. As per federal standards, occupant compartments and beds of pick up trucks serve different purposes and most of the time the cargo area isn’t safe for passengers. Around 30 states and the District of Columbia have implemented laws to address the hazards of passengers riding in cargo compartments. In Arkansas also, there’s a restriction on passengers riding in cargo areas, except when the passengers are employees on duty. This provision prohibits people from riding on fenders, hoods, or other places that aren’t meant for people. With ridesharing apps becoming all the rage these days, new state laws are being implemented across the US to ensure the safety of drivers and riders. In Arkansas, both Uber and Lyft have the necessary permits to operate. Ridesharing companies need to obtain a permit from the Arkansas Public Service Commission to establish their operations in the state. These companies must maintain minimum liability insurance of at least $1 million to cover death, personal injury, and property damage while the driver is engaged in a ride through the app. The law also regulates few other safety measures such as – drivers must be 19 years old, maintain liability coverage, drive vehicles that have cleared safety checks, and pick passengers engaged only through an online medium. Automated vehicles are slowly and steadily making an inroad in our lives to ease the effort involved in driving and for better traffic management. Resultantly, many states are allowing automakers to test self-driven cars on their roads and highways. Till now, Arkansas hadn’t allowed testing of automated vehicles on its roads. But, the Arkansas Senate finally approved the testing of driverless vehicles on its state roads and highways which is expected to become a law soon. Signing this law would make Arkansas the 30th state to allow automated vehicles on its roads. Arkansas is already among the 19 states that regulate platooning technology, which enable groups of large-sized trucks to move together on roads with previously set distances at a mandated speed. There are many factors that lead to unfortunate accidents on roads, with driving under the influence of alcohol and other substances being frowned upon the most. The look-back period in the table is the number of years a DUI offense stays on your record. Mobile phones lead to around 15 percent fatalities each year in the US, hence it’s best to stay focused on the road while driving. Use of hand-held devices for voice calls while driving: If you’re under 21, you aren’t allowed to use a hand-held device at all while driving. If you’re over 21, you are allowed to talk using a mobile phone. Texting while driving: Texting is prohibited for all drivers in Arkansas while driving. School and highway work zones: Laws in Arkansas prohibit all mobile phone usage during school hours and when highway work is underway. You have gone through everything in this guide that would help you to stay safe on the road and buy necessary coverage so that you don’t have to worry about medical or property damage expenses if you happen to be involved in an accident. In this last section, we would share some facts about Arkansas’s vehicle theft and fatalities rate which might influence rates in some counties and cities. Which cars are mostly stolen in Arkansas? Seems like Chevrolet is the brand of vehicle most commonly stolen. In case you wish to know how many cars were stolen in your city, search in this table. Being the most populated city in the natural state, the number of vehicle thefts was highest in Little Rock. Being aware of the common causes of accidents and fatality rates in your state helps you to stay safer while driving. Who were the people hurt in these accidents? Were they passengers, pedestrians or motorcyclists? What led to the crash? Was it speeding or a rollover? In 2016, 44 teens were arrested for driving under the influence (of alcohol) in Arkansas. The alcohol-impaired driving fatalities rate for those under the age of 21 per 100,000 people was around the national average of 1.2. How soon does the emergency medical service reach you on the accident site can also impact the chances of survival in a fatal crash. Traffic congestions and accidents happen more in cities with a higher number of vehicles on roads. On average, residents in Arkansas own two vehicles. In the image below, you can see the national averages as compared to Arkansas for the number of cars owned by residents. The average commute time in Arkansas is 20.5 minutes which is quite lower than the national average of 25.3 minutes. Around 83 percent of the commuters prefer to drive alone in Arkansas which is close to the national average of 76 percent. Now that you know everything about car insurance in Arkansas, let’s get you started with our FREE online rates comparison tool.